I have always enjoyed my solo runs. 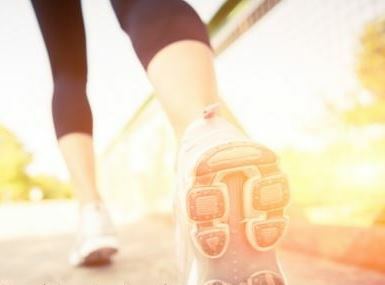 There is such freedom in just running—the sound of my feet hitting the pavement, the fresh smell of rain, the giving of my heart and all my worries and frustrations to God. He always seems to meet me there. It was no different this particular cold winter day. I had recently been at our church’s Sanctity of Human Life Service, and my heart was heavy with the loss of these sweet babies. “God, what can I do?” The answer was crystal clear: you can run and you can pray. It was one of those moments when you know God has spoken to you, and you think, “Did that really just happen?” But those words never went away, even though I had no idea what plan God had in mind. At the time I had four kids age six and under. “What can just one person do?,” I wondered. Still, the words didn’t leave—especially when I ran. Finally, I consented to the Spirit’s leading and told my husband, Nathan. Though the details were muddy, it was clear that God wanted me to run to raise money for the cause of life. I wrote an email to Randy Alcorn explaining what God was doing in my heart and asking for some direction. I knew once the words were out there, I was accountable to them. Shortly after that service, my pastor preached on not wasting your life, and living “all in” for the gospel of Christ. It cut right to my heart, and I decided to also email my pastor and tell our Community Life group. Always the visionary, Nathan encouraged me to dream big. He said, “Let’s put on a big race with hundreds of believers joining together for one cause. It will be great!” Whoa…didn’t God just want me to run a few races, raise money through pledges and give it to a cause? That seemed doable, though still out of my comfort zone. Coordinate a big race for hundreds of people? That was crazy. The doubts and “what if’s” surged through my mind. I met with Randy’s assistant (who happens to be my wonderful aunt) and told her about the idea for the race. She was so excited and encouraging. God seemed to be confirming this direction the more I talked with others. And then…life happened. There were dishes to do, piles of laundry to wash, children to read to, marriage to invest in, church and Bible Study to attend. The days were full. But the idea never went away. Two years later, we were at another Sanctity of Human Life service and again were struck by how abortion IS the American Holocaust. Ray Comfort’s 180 video (www.180movie.com) was given out at the service. We watched it that week with our Community Life group, and as soon as it ended, my husband and I looked at each other and said, “This is the year.” We talked about it with our group and prayed that God would bring us people, as this wasn’t something we could tackle on our own. Of course, He knew that and had already been preparing another couple well before we were aware of the need. I had talked with my aunt and she encouraged me to give the proceeds of the run to something concrete, such as a mobile ultrasound unit. I had never heard of one, but a few days later, a friend posted a link on Facebook to a similar mobile ultrasound unit ministry. The more we started hearing about mobile ultrasound units, the more confirmed we were in the direction God was taking us. It felt so out of reach, but we began praying God would bring a mobile unit to the streets of Portland. Meanwhile, God was moving in DJ and Allison Van Zanten (another couple at our church) in the same way. They had just watched the 180 video and had the same conclusion—we must do something now. One night they were sharing with friends about this and said, “What if we took an ultrasound machine and put it in a van and offered ultrasounds to women?” Their friends (who happened to be in our community life group) said, “Do you know Nathan and Heidi Boos? They were just talking about the same thing.” Allison sent me a Facebook message asking if we could get together. After a four-hour meeting over dinner we realized God had been knitting our hearts together for some time. Together we worked over the next six months on all the details of putting a ministry together. What would the name be? When and where should the race be? What if no one shows up? Who should operate the mobile unit? How are we going to raise enough money? There were more questions than answers—and much, much prayer. At times, the answers came quickly. Other times, God was seemingly quiet and nothing moved forward. There were closed doors, disappointments, worry, marriage strife and family woes. There were days my doubting heart asked, “Who am I to try and head up a ministry like this?” Then I realized it was not as if God was dependent on me being cleaned up enough to go to work for Him, or as if I even could “clean up” for God. After all, the Bible says my righteous works are like filthy rags. Yes, God uses His broken and imperfect people so all the glory is His! By January 2013, we were The Guardian Project—raising funds for Oregon’s first ever mobile ultrasound unit. In just five months, we were fully funded to purchase the mobile unit. We held the race in September 2013 and despite my fears, we had over 900 participants! This was truly the result of God bringing believers together to give of their time, money, prayers and support. 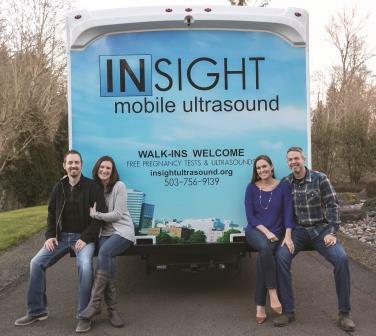 Insight Ultrasound, Oregon’s first ever mobile ultrasound, was commissioned in March 2014 for use by Portland Pregnancy Resource Center. One day a week, the van can be found at Portland State University, and three days a week in the North Portland area, offering Christ's love, truth, and hope to women in need. The Guardian Project story is simply a story about who God is and how He works through His people. Like pieces of a puzzle, each of us has a part in God’s story. He’s going to accomplish His plan and by His grace, He invites us to join in. I’m so grateful for the hundreds of people who followed His still, small voice, be it a quiet nudge or a clear call. He used all of us to accomplish this. To Him be the glory! Heidi Boos is a homeschooling mom and an active member of Good Shepherd Community Church near Gresham, Oregon. She and Nathan are the parents of four girls and are expecting a boy in November! This article originally appeared in the Fall/Winter 2014 edition of Eternal Perspectives magazine. Pregnancy resource centers have the tremendous opportunity to both meet practical needs, and share the Gospel. It is the kind of ministry I believe God is calling many to get involved in. Obstetric ultrasound is a safe and noninvasive procedure using high frequency sound waves to provide a picture of the moving fetus on a monitor screen.